where "Raise Your Voice" was filmed. "Bristol-Hillman", the performing arts school which Hilary Duff attends, doesn't really exist. at 306 S. Loma Drive (at the corner of 3rd Street & Loma). "Party of Five", "Providence", "The Pretender", a Macy Gray video & dozens of commercials. plays her amplified violin in the public space (see the photo below). 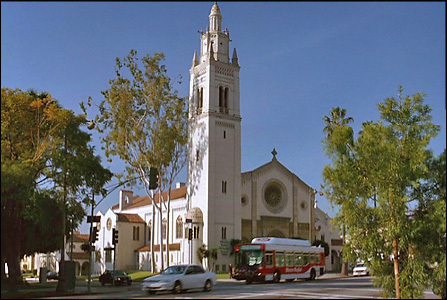 across the street from (east of) historic Olvera Street. "The Island", "Charlie's Angels 2", "Pearl Harbor" & "The Italian Job". More "Raise Your Voice" Locations! Just click below. 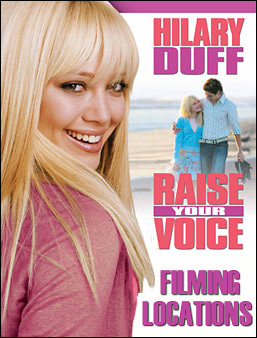 The photos on this page are stills from the DVD of "Raise Your Voice"